I’m going to make this short and sweet, because I think this pizza speaks for itself: It’s a twist on classic Hawaiian pizza, made healthy with a cauliflower crust. This recipe is gluten-free with a Paleo-friendly option. And it’s loaded with toppings. The cauliflower crust is baked for 18 to 20 minutes before toppings are added. The toppings are fried in a frying pan before being placed on the pizza crust. For Paleo diets, omit mozzarella cheese. Get the Paleo cauliflower pizza crust recipe. Follow along on Instagram! Get recipe sneak peeks and photo updates for your viewing pleasure. Make one cauliflower pizza crust. 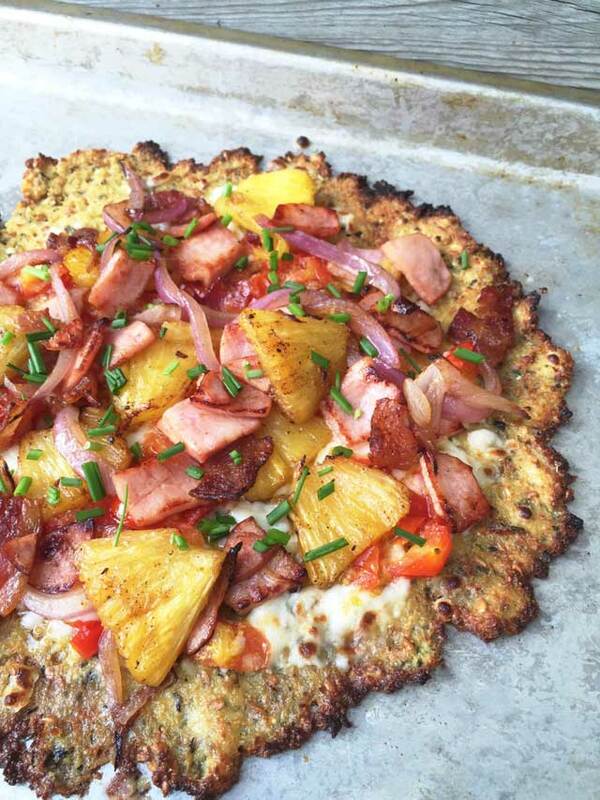 While pizza crust is baking, place bacon, Canadian bacon, pineapple, red pepper, and onion in a large frying pan. Fry in olive oil over medium-high heat for a few minutes, until ingredients begin to brown. When pizza crust is done baking, turn on the broiler. Top the pizza crust with cheese and sauteed toppings. Heat pizza in broiler for a minute or so, just long enough to melt the cheese and heat the toppings. Top with chopped chives and serve.